This is a complex art operating system diagram that is showing interconnections between people, organizations and projects that were developed between Belgium, Slovakia and Check Republic. 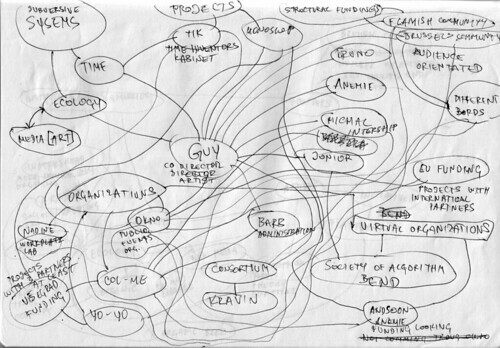 Diagram was sketched during Multimedia camp (MMKamp’09), an event held in Art Workshop Lazareti in Dubrovnik, where different artist and art organizations were introducing their work and where future plans created for art/ecology/performances projects and collaborations. Art operating systems here are brought to such difficulties by always following state systems – each artist creates a group, connects it to another group in another country or city so opportunities grow bigger. Each artist and group open their project that includes multidimensional outputs. They interact with each other on basis of funds received and needs to express. Complexity of interchange and interactions are mostly due to EU cultural funders and policies.